With a stay at Docklands Executive Apartments, you'll be centrally located in Docklands, steps from Yarra Riverfront and within a 10-minute walk of Central Pier. 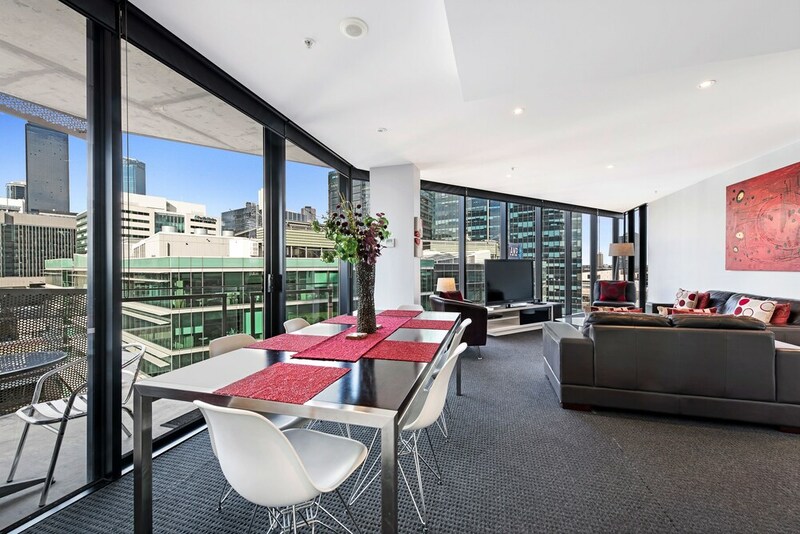 This 4.5-star apartment is 0.6 mi (1 km) from DFO South Wharf and 0.6 mi (1 km) from Melbourne Convention and Exhibition Centre. Make yourself at home in one of the 50 individually decorated guestrooms, featuring kitchens with full-sized refrigerators/freezers and stovetops. Rooms have private balconies. Cable programming and iPod docking stations are provided for your entertainment, while complimentary wireless Internet access keeps you connected. Conveniences include desks and separate sitting areas, and housekeeping is provided weekly. Enjoy a range of recreational amenities, including an outdoor pool, a spa tub, and a steam room. Additional features at this apartment include complimentary wireless Internet access and a hair salon. Satisfy your appetite at one of the apartment's 4 restaurants. Wrap up your day with a drink at the bar/lounge. Featured amenities include express check-in, express check-out, and luggage storage. A roundtrip airport shuttle is provided for a surcharge (available 24 hours), and self parking (subject to charges) is available onsite. In addition to an outdoor pool, Docklands Executive Apartments provides a spa tub and a steam room. Dining is available at one of the apartment's 4 restaurants. The property also offers a grocery/convenience store. A bar/lounge is on site where guests can unwind with a drink. Public areas are equipped with complimentary wireless Internet access. This luxury apartment also offers laundry facilities, express check-in, and express check-out. For a surcharge, a roundtrip airport shuttle (available 24 hours) is offered to guests. Parking is available onsite for a surcharge. Docklands Executive Apartments is a smoke-free property. Nixon Hotel - This pub serves lunch and dinner. Guests can enjoy drinks at the bar. Open daily. Nine Elephants Thai - This restaurant specializes in Thai cuisine and serves lunch and dinner. Reservations are required. Open select days. Banoi - This restaurant specializes in Vietnamese cuisine and serves lunch and dinner. Open select days. De Mad Hatter - This Cafe serves breakfast, brunch, and lunch. Va Bene Pizzeria - This restaurant specializes in pizza and serves lunch and dinner. An outdoor pool and a spa tub are on site. Other recreational amenities include a steam room. This property's policy is to refuse certain bookings for the purpose of group events or parties, including pre-wedding stag/bachelor and hen/bachelorette parties. Only registered guests are allowed in the guestrooms. Some facilities may have restricted access. Guests can contact the property for details using the contact information on the booking confirmation. Alcohol is not served at this property. Parking height restrictions apply.